Positron emission tomography (PET) scans are used to produce detailed 3-dimensional images of the inside of the body. The images can clearly show the part of the body being investigated, including any abnormal areas, and can highlight how well certain functions of the body are working. PET scans are often combined with CT scans to produce even more detailed images. This is known as a PET-CT scan. They may also occasionally be combined with an MRI scan (known as a PET-MRI scan). A PET scan can show how well certain parts of your body are working, rather than simply showing what they look like. PET scans are particularly helpful for investigating confirmed cases of cancer to determine how far the cancer has spread and how well it's responding to treatment. PET scans are sometimes used to help plan operations, such as a coronary artery bypass graft or brain surgery for epilepsy. They can also help diagnose some conditions that affect the normal workings of the brain, such as dementia. PET scanners work by detecting the radiation given off by a substance injected into your arm called a radiotracer as it collects in different parts of your body. In most PET scans a radiotracer called fluorodeoxyglucose (FDG) is used, which is similar to naturally occurring glucose (a type of sugar) so your body treats it in a similar way. By analysing the areas where the radiotracer does and doesn't build up, it's possible to work out how well certain body functions are working and identify any abnormalities. For example, a concentration of FDG in the body's tissues can help identify cancerous cells because cancer cells use glucose at a much faster rate than normal cells. PET scans are usually carried out on an outpatient basis. This means you won't need to stay in hospital overnight. It's important to arrive on time for your scan because the radiotracer used has a short shelf-life and your scan may be cancelled if you're late. Your appointment letter will mention anything you need to do to prepare for your scan. You'll usually be advised not to eat anything for 6 hours beforehand. Drinking is allowed, but you should ideally just drink water. You should also avoid strenuous exercise for 24 hours before your appointment. It's a good idea to wear loose, comfortable clothes. It may be possible to wear these during the scan, although sometimes you may be asked to change into a hospital gown. Avoid wearing jewellery and clothes that have metal parts, such as zips, because these will need to be removed. If you're claustrophobic, ask the hospital staff before the day of the scan about the possibility of having a mild sedative to help you relax. Before the scan, the radiotracer is injected into a vein in your arm or hand. You'll need to wait quietly for about an hour to give it time to be absorbed by the cells in your body. It's important to relax, keep as still as possible, and avoid talking while you wait because moving and speaking can affect where the radiotracer goes in your body. You'll be able to go to the toilet if you need to before having the scan. During the scan, you lie on a flat bed that's moved into the centre of the large, cylindrical scanner. Stay still and don't talk while the scanner takes pictures of your body. The scan usually takes up to 30 minutes. Having the scan is completely painless, but you may feel uncomfortable lying still for this long. If you feel unwell at any point, there's a buzzer you can press to alert the medical team. They'll be able to see you throughout the scan. You shouldn't experience any side effects after having a PET scan and can usually go home soon afterwards. The results of your scan won't usually be available on the same day. They'll be sent to your specialist to be discussed at your next appointment. Any exposure to radiation carries a very small risk of potential tissue damage that could lead to cancer at a later date. But the amount of radiation you're exposed to in a standard PET scan is small – about the same as the amount you get from natural sources, such as the sun, over 3 years. The radiotracer becomes quickly less radioactive over time and will usually be passed out of your body naturally within a few hours. Drinking plenty of fluid after the scan can help flush it from your body. As a precaution, you may be advised to avoid prolonged close contact with pregnant women, babies or young children for a few hours after having a PET scan because you'll be slightly radioactive during this time. 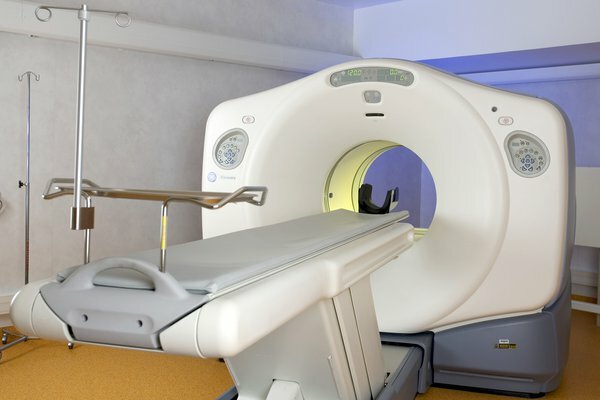 The CT component of a PET-CT scan also involves exposure to a small amount of additional radiation, but the risk of this causing any problems in the future is still very small.